As I write this it’s my birthday. As you read it, it’s the day after my birthday. That’s how things go sometimes. Anyway, here I am, here you are. Let us discuss things. Okay, I seriously hope I don’t see Thrall again for a long time. Maybe never, if that’s possible. I want Chris Metzen to return somehow, but man, not as Thrall. This isn’t even out of some hate on for Go’el. The dude deserves a break. So what came first? the Chicken Mount, or the Player Egg? Since both invertebrates and vertebrates lay eggs, it’s safe to say eggs came before mounts. And since reproduction is a system that could be comparable to a game (loser doesn’t get to reproduce) one could argue that the first player egg arose from the first creature that reproduced via eggs, and therefore it far preceded Chicken Mounts. Q4tQ @MatthewRossi Dinosaur expansion. How and what. GO! Okay, let’s take a serious look at this. First off, if I was going to do a dinosaur expansion I’d probably just establish a brand new continent on the other side of Azeroth. Yep. Not even close to Kalimdor, the Eastern Kingdoms, Northrend or Pandaria. I figure ancient Kalimdor was the biggest and most populated continent, the one the Black Empire got started on, the one the Titans landed on and did experiments on, and so the new continent would be one that never saw any of that stuff — no Old Gods or their servants, no Titans or Titanforged, and so it developed entirely differently. I would then immediately betray this idea by having Saurok, Tortollans and the new snake people from Battle for Azeroth all over this new, unspoiled land even though that makes zero sense. 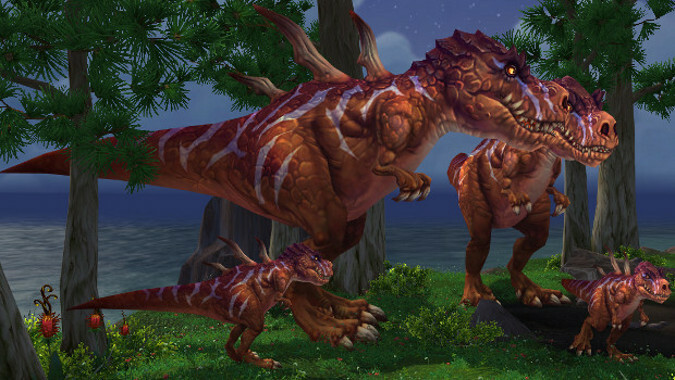 I’d make the expansion about how these new Allied Races were dragging the Horde and Alliance into a Dinosaur War, like the one that actually happened in the American Old West between Cope and Marsh, except with living dinosaurs. No, I’m not making that up. Heck, the Horde’s going to have Zandalari Dinomancers, so throw them in too. I see it as four leveling zones, each kind of loosely based on a different period of prehistory but suitably mashed up for fun factor. So one zone would be essentially the late Permian with critters like Inostrancevia and Scutosaurus, another would be the Triassic with early dinosaurs, other archosaurs, and a few remaining therapsids like Cynodont. Then there’d be a Jurassic zone — enormous sauropods, lots of pterosaurs and of course Allosaurus-like creatures that would seem like a mix between raptors and devilsaurs. And finally an Azerothian Cretaceous which could reuse most of the dinosaurs we already have in game. I’d pick a big bad no one has ever seen or heard of before — a kind of dinosaurian primordial wild god or something similar that isn’t clever or evil but is perhaps used as a weapon by another group since it’s easily manipulated. And the Alliance and Horde get sucked into this dinosaur war because they don’t want the other faction to be the ones with all the cool dinosaurs. Essentially it’s the latest Monster Hunter game, only without killing the dinosaurs, or at least not all of them since you’re out to capture them for your faction. Another stupid question: There are stained glass windows in the Paladin class order hall which apparently have the sun shining through them. But the order hall is entirely underground. In fact, it appears to occupy the same space as much of the tombs behind the church. How do they do that? It’s not the sun. It’s the souls of the honored dead, the same Light that nearly destroyed Darion Mograine twice — once when he and the Knights of the Ebon Blade attacked Light’s Hope Chapel on the orders of the Lich King, and the second time when he and the Horsemen attacked Light’s Hope on the orders of the Deathlord. Who was following the orders of the Lich King. Granted, it was a different Lich King. Basically instead of there being stained glass to let sunlight in, it’s there because it looks pretty with the souls of those that died in the Light’s service shining through it. So, with these zone scalings, is that going to apply to dungeons & raids too? That’s going to seriously hamper my mount grind. According to our Rachelle Riddle, the answer is that no, raids are not being scaled. However, do keep in mind that with Timewalking, there’s a kind of scaling for raids, and also, there are currently reports of there being some bugs with scaling on the PTR that make soloing old content harder. If you want to make sure you can keep transmog farming or soloing in older raids, you may want to hop on to the PTR and give some feedback pronto. Today it occurred to me that perhaps, in 7.3.5, while they’re tweaking everything else, they could add one tiny Legion feature to TBC Outland. > Yeah yeah, I’ve seen this already. Lemme talk to A’dal. If I were cruel I’d insist that was in already and refuse to admit I was lying, but I’m not cruel. I definitely think that’s a good idea. I’d like to see it introduced to every time we have a dialogue like that one, although I don’t know if Legion deserves the credit — I’m pretty sure this was implemented in previous expansions like when dealing with Prince Arthas and his extremely long RP dialogue in CoT: Stratholme. Okay, that’s the Queue. Sorry for no cool pictures, but it’s my birthday and I wanted to take it easy. See y’all next week.